Commentary of an Academic (Copyright @ 2013 by Chester B Cabalza. All Rights Reserved). For the first time I arrived in Istanbul, the European side of Turkey, last April where I attended an international conference and presented a paper on the current status of the peace process in southern Philippines. I remember during the welcome remarks of Yildiz Technical University’s president, being the modest host on behalf of his over a century old technical university, he welcomed all the pre-selected 30 social scientists and discussants across the continents in the world to the ‘most beautiful city’ on earth. During the conference, I met Egyptian sociologist Ahmed Mousa Badawi, a fellow panel member, including scholars from Bulgaria and the USA with our moderator from UK. The panel we joined seen as exceptional group that represented different intellectuals from various continents of Asia, Europe, Africa, and North America. Dr Badawi virtually became my friend through Facebook. When a people power recently erupted in Egypt, I saw his photos and read his up-to-date shout outs, as one of the prime movers in his country’s political upheavals, until the fall of President Mohammed Morsi. Just a brief observation, the touristic city of the Turks is a real standout surrounded by vestiges of the great Ottoman Empire. Grand mosques are all over the city with a special panoramic view during the Bosphorus tour. I was totally awestruck upon seeing the most handsome mosque in the city – the Sultan Ahmed Mosque also known as the Blue Mosque for many non-Muslim tourists. The perfect domes and six minarets are a fusion of the Ottoman and Byzantine influences. The Hagia Sophia also exudes grandeur of the erstwhile Byzantine Empire. Turkey, perceived as the most liberal Islamic country in the world was envisioned by the great reformist Mustafa Kemal Atatürk. During my wandering to the luxurious shopping lanes in Taksim Square before the Hash tag #Occupy Gezi trended in social media, I never imagined that only a month after my visit to Taksim, an environmental group’s outrage would erupt. 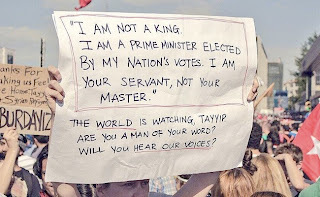 Ultimately it turned out to be a political protest against authoritarian Prime Minister Recep Tayyip Erdoğan and his brutal police force who tried evicting protesters in Taksim Gezi Park. Last May, the famous Taksim business district ambushed by political unrest. Naysayers attributed it to Erdoğan's alleged plan to enact a new constitution based on a presidential system. As planned, the current prime minister will reap the fruit of his new political system, as its first president. By chronology of events, initially the Taksim protest started when Turkish authorities planned to rehabilitate the Gezi Park as a pedestrian square and rebuild a military barracks. Environmentalist groups rallied for the protection of the park but the government's course of action using police brutality ignited certain Pandora's Box of fury which resulted to a series of antigovernment protests. To end the conflict, five demands were issued by Taksim Solidarity, one of the prime movers in the Occupy Gezi protest. In gist, they insisted on the preservation of the park, observance of freedom of assembly, no to sale of public resources, no to arrest and torture, and respect the media. Egypt has had its historical share to the Arab spring based from popular revolutionary wave that began in December 2010 which ousted the three decade old regime of autocratic President Hosni Mumabrak. After 18 days of the first people power held at Cairo's Central Tahrir Square, Mubarak fell from his power. The second people power occurred when President Mohammed Morsi, the first democratically elected president in Egypt, has been overthrown by his people through a solid military intervention, with expired ultimatum ordered by Army chief General Abdel-Fattah el-Sissi to find a solution to meet the demands of antigovernment demonstrators in 48-hours. The 62-year-old president defiantly insisted on his legitimacy until he fell from his post and suffered tremendous dissatisfaction on his conduct to govern his country despite unlimited powers bestowed upon him to protect the nation. As the fifth president of Egypt, Morsi’s government backed by Islamists supporters has been tested thrice, and his abrupt fall in July 2013 touted as the ‘third wave of Egyptian revolution’ beginning 2011. Morsi, as the successor of fallen leader Mubarak, was seen as a shadow of his mentor. When he accepted his defeat, he pronounced on national television, that Chief Justice Mansour would step in as interim president until new elections are held. However, the interim president Mansour was appointed to court by Mubarak and elevated to chief justice post by Morsi himself. Is this a vicious cycle of political anomaly? In Ian Black’s analysis, Middle East editor of online news the Guardian, he highlighted opinions of leaders in the region. Syria’s president, Bashar al-Assad said that Morsi’s ouster represented the “fall of political Islam”. On the other hand, Turkey's foreign minister said that it was unacceptable that the Egyptian president had been toppled by a military coup. What lessons can be drawn from the two political upheavals in Turkey and Egypt? From the traditional state-centric national power to human-centric form of security nowadays, point blank we can say that all leaders should listen to the voice of the people. Most leaders are democratically elected based on majority votes of the people. Therefore, as servant-leaders they should serve the interest of the nation-state and heed to those who elected them. Some scholars call the recent people power in Cairo a coup. However, in the discourse of coup d'etat, neither the conflict in Egypt was initiated by the military nor the government was overthrown by military forces. It was actually planned by Egyptian citizens. The voice of civilian people and the civil society has prevailed. Social media certainly will play a major role in future dispositions of people power. Everybody around the world are interconnected now. We should not undermine the power of the people. Gone are the days when pharaohs and sultans are the supreme being of their own lands. National and world leaders today are no longer invincible. They should serve the interests of the people and not the oligarchs. Human rights must not be overruled by security actors such as the military and the police forces. People power is a gift because all of us are empowered to choose our own good leaders. Abusive leaders should end unaccountable governments and must be removed from their long-serving posts. Poor governance of hungry-tyrant leaders certainly brings economic uncertainty in many fronts. Istanbul and Cairo should end their respective internal political strife and mature as moderate and democratic Islamic country. Two mighty ancient cities blessed with world touristic destinations that should never fail to show the real beauty of their countries to the entire world. Why you still have supporters of Morsi na nagkakalat na lagim Sa Cairo? magulo pa rin sa Egypt!